…and we are joined by an American contingent – The Rook (don’t ask. We all have and there is, apparently, no answer.) and his wife Cheryl – for a trip to the Post Office Social Club , where The Yards are topping the bill. Firstly, though, a big “Thank You” to Andy of either version of The Runaway Sons (it will all become clear, I promise you) for responding so quickly to my email and sorting out exactly how was playing when for the support acts. First up was Mike Newsham and his acoustic guitar. Mike reminded me a little bit of a cross between country music and Bruce Springsteen and was pretty good. As I’ve mentioned before, I think it must take a load of nerve to stand up on your own in front of an audience and belt songs out and the only time Mike let himself down was between songs when his mumblings into the microphone were pretty unintelligible. Having said that, of course, we didn’t pay to hear any of these guys speak. Next up were Jim Gipson and The Runaway Sons. The Sons used to be a four-piece. Well, actually, they still are a four-piece, just not the same four. Mike Newsham used to be their drummer and they have also lost guitarist Mark Wynn. They are now original members Andy Gaines on guitar and Ben Cordrey on bass, joined by Jim Gipson (guitars and vocals) and Claude (drums). Jim has an absolutely brilliant, huge voice which was (I think) helped a bit by a touch of echo on the mike. Andy plays guitar with a manic style. Ben’s bass-playing was accomplished and his backing vocals were very clear. I can’t say much about the drumming. There is a style of music, which I particularly associate with The E-Street Band (there’s a theme developing tonight…) where everybody seems to be playing different tunes using different rhythms but which all come together to sound good (think the end of Thunder Road) and a few of their songs reminded me of this style. Not a bad thing at all. Perhaps because this was this line-up’s first gig together, there was a time when momentum was lost slightly as guitars were tuned on stage but, overall, this was a very good performance and included some tunes that I would gladly pay money for. Let’s hope there is some recorded material soon. And, finally, The Yards took to the stage. Most of our group had seen them before. Not me, although I had seen Chris Helme at Fibbers – a disappointing performance where he seemed more interested in messing about with the audience than playing music. Thankfully, as part of a group, he is much more focused. Normally, there are five Yards but, tonight, they were down to four – keyboard player Jon Hargreaves is off doing a Phd. They played a solid, entertaining set. Chris has an extremely distinctive voice and used it to good effect while Chris Farrell did his best to lose a couple of pounds through energetic guitar playing and novel use of effects pedals. I had listened to their (so far) only studio album a few weeks ago but could neither remember many of the songs, nor tell whether the lack of keyboards made a difference to the live sound. Tonight’s performance was, however, good enough to entice me to visit the merchandise, errrr, table and hand over some hard-earned for both the aforementioned self-titled album and an earlier live one, recorded in York Minster. The latter, if only to see how such a brash, loud band could possibly have played such a venue. 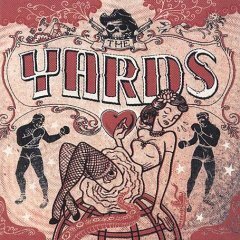 The Yards 2005 album is strongly influenced by sixties and seventies rock, updated with a modern sound. There is a hint of psychedelia in the keyboard introduction to anti-Bush song Crime, while another dig at George Dubbya, The Devil Is Alive and Well and In DC, is a pulsating drum-led track. Lyrically, some of the songs come up a bit short – for example, Up ‘Til Dawn is basically just a chorus sung twice – but the music makes up for that. There is a good mix of styles, from pounding rock to almost-ballad and, despite jumping on the musicians-as-messengers bandwagon perhaps a bit too early in their careers, is a very good listen. Live at the Minster is from 2004, when The Yards were joined by Hayley Hutchinson (vocals and percussion) and James Lindsay (cello and vocals) for a charity gig in aid of Brazilian children. Obviously, because of the venue, this was a much softer, acoustic performance compared to tonight’s. Even the audience’s applause seemed more polite. Language was toned down in at least one of the songs (Crime) and, for some reason, The Devil is Alive… was not performed. However, from the ten songs on this CD, six appear on the studio release. It is another good performance, with Hutchinson’s backing vocals adding to the softer sound. My only complaint is that the recording appears to have been heavily cut in terms of the bits between songs. I like my live CDs to reflect the concert as closely as possible, audience interaction included. This entry was posted in Live Music and tagged Jim Gipson, Mike Newsham, Post Office Club, The Runaway Sons, The Yards. Bookmark the permalink.